Built in 1914-'15 by William Hamilton & Co., Port Glasgow, #229, for the Indo-China Steam Navigation Co., Hong Kong and purchased by the Admiralty while on the stocks on 22 March 1915, launched 10 May 1915. On 4 May 1928, BACCHUS was in collision with the Greek cargo ship IOANNIS FALAFOS in the English Channel, 20 nm. south of St. Alban's Head, Dorset. IOANNIS FALAFOS sank in three minutes with the loss of ten of her 22 crew. The survivors were initially rescued by BACCHUS but she was severely damaged at the bows and was abandoned as it was thought that she would sink too. The British cargo ship MANCHESTER COMMERCE took all on board. BACCHUS was later reboarded once it became apparent that she would remain afloat. She was towed into Portland Harbour stern-first by an Admiralty tug. BACCHUS was subsequently repaired and returned to service. 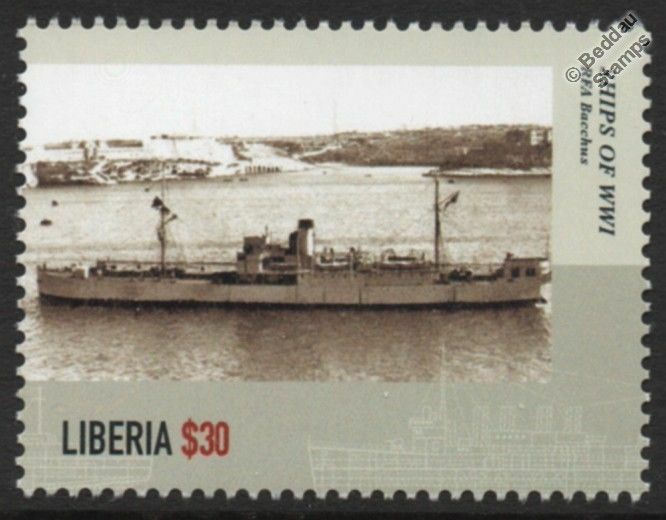 She was renamed BACCHUS II in May 1936 in order to free the name for a new ship. She was sunk as target on 15 November 1938, 10 nm. off Alderney, the Channel Islands, by gunfire from the cruiser HMS DUNEDIN.